John Michael McDonagh’s Calvary opens brilliantly. Father James, an Irish priest listens in a confessional booth to the calm recital of a man who suffered molestation at the hands of the clergy. This disembodied rational voice isn’t seeking absolution for feelings of anger and vengeance nor is he interested in performing half-a-dozen Hail Marys. His perpetrator is long dead and he is filled with murderous intent. There is only one option available to him: kill a priest. But not just any priest a good priest, in fact the very same to whom he is now confessing his intended sin. But he’s reasonable. He gives him seven days to get his matters in order. This is McDonagh’s pre-credit set-up and it is utterly flawless. Recognizable (a Christ-like figure is about to be sacrificed, hence Calvary) it is completely unlike the bungling Hollywood cinematic features on religion that tend towards musically kitsch productions or are swathed in blood and gore. Calvary however is different and bravely introduces a range of unvarnished conversations that delve into the very catacombs of human instinct: is it really possible to willingly sacrifice one’s life so that others might live? It’s a big question and jostled by far too many equally important other comments on suicide, gay relationships, physical abuse and moral bankruptcy to ever sustain a strong narrative core. Overwhelmingly, it seems, the sense of detachment, of indifference characterizes the film: it is that which separates us into predators, victims, defenders and by a large majority, bystanders. Questions of ‘good’ and ‘evil’ ask to be broadened beyond their black and white binaries and yet past the opening scene with all its simmering potential – the film simply disintegrates. 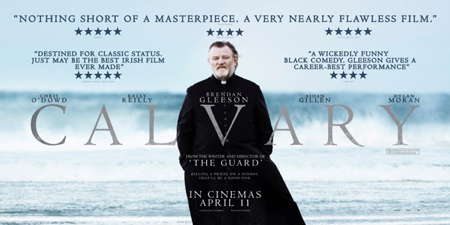 Led by the supremely talented Brendan Gleeson (who is exceptional) an all-star cast including Chris O’Dowd, M. Emmet Walsh, Aiden Gillen and Kelly Reilly fail to deliver much more than a one-dimensional caricature of the loose and lost sheep that this stalwart shepherd must marshal through the daily grind. Gleeson, however, is excellent. A strong sage, he is a wise but not wizened character, a quiet tour-de-force and respectful figure to his rather rambunctious congregation in the remote county of Sligo, Ireland. Amidst a prophecy of unavoidable death he goes about his weekly business as a man of the cloth catering to his unscrupulous parish. In a lifetime before the priesthood he was married and had a daughter (one who has come to visit with slits on her wrist) and we discover he has a fondness for drink that has not dissipated over the years. He is after all, human. His small flock who dutifully show up for Holy Communion include a stock-market swindler, an abusive butcher and his flirtatious wife (who coincidentally is having an affair with the local mechanic who hails from the Ivory coast); an ageing American writer and an ethically ambiguous policeman whose boyfriend has possibly one of the worst Bronx accents possible. And of course his young smart-arse assistant who’s more interested in how flattery can coax a few thousand extra euro from those who believe money can offer redemption. Far from didactic it’s a contemporary examination of Catholicism especially in light of the many cases of paedophilia brought forward against the church in the last decade. Yet McDonagh’s mostly two-hander scenes that dominate this rather episodic seven day march to inevitable death is less of an emotional avalanche than a somewhat quietly suspenseful tremor. The pace falters, the narrative is scattered; and although set against the fierce green landscape of Yeats’ Ireland (countless references are made both to the politics and the land) this potentially acute observational drama laced with drippings of black comedy it is nevertheless lacking both in authority and substance. However, despite its flaws Calvary remains a powerful testimony to our grasp of current and troubling issues. While Gleeson’s acting talents may steal the show the film is also a powerful reminder of the words of St Augustine that grace the screen at the very beginning: Despair not, one of the thieves was spared; presume not, one of the thieves was not. A quote that also finds its way into Beckett’s Waiting for Godot (and for good reason) it is one of the tenets that make this film worth watching – if not for Gleeson then almost certainly for the post-film discussion of McDonagh’s handiwork and the questions it raises.